I recently stopped into Porsche of Orlando to pick up a new hat since my other one needed a make over. My visit would end up much more exciting than I expected when my left eye caught a brand new 2014 911/991 Targa 4S in the showroom. It started with the purchase of a hat to support a brand I care so deeply about, and ended up with this video of a currently for sale 2014 Porsche 911 Targa 4S. The roof and rear glass make this car so special dating back to the early 1960's when the top half of the 911 was designed and a sub brand of Porsche (named Targa) was established. The Targa originally had a manual pop off roof that you would have to store somewhere like the garage and the roll bar would stay with the rear window. This is one of Porsche's most stylish design's for decades making it the most requested car from Porsche for more information by customers. 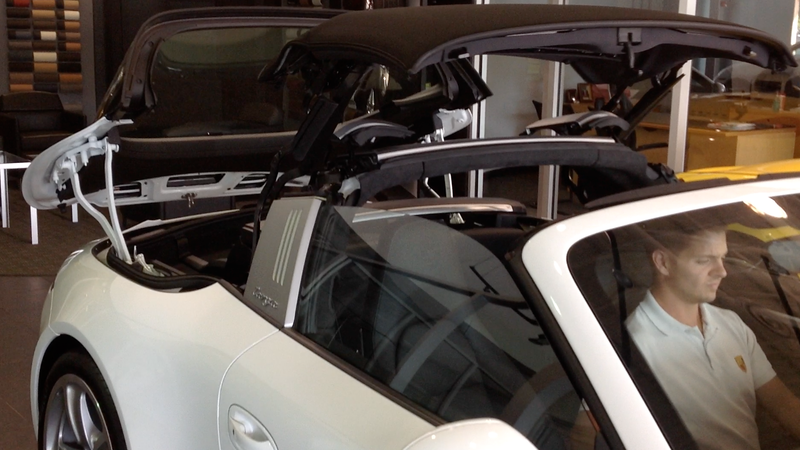 In the 2000's, Porsche had changed the traditional Targa roof to a solid glass roof that retracted back opening the roof up but not completely. To me, this was kind of a bummer. Then, when Porsche released the 991 Targa design, the top was put down at the debut, the audience roared, and everyone felt that tingly feeling you get when you witness something special happen. Thank you Porsche of Orlando.